Thats crazy....I used to Hate purple as well and the exact same thing happened t me, sometime last year I liked it and have even purchased clothes with purple in them! Don't forget aubergine, eggplant and perrywinkle. I am a floral designer and lately every design has been based on some hue of purple. I love spring for all it's beautiful purple hued flowers. I'm not much of a purple person in my personal life, but some of my favorite sweaters have been purple. I love the gentleman in the mustache! Purple is my absolute favorite! 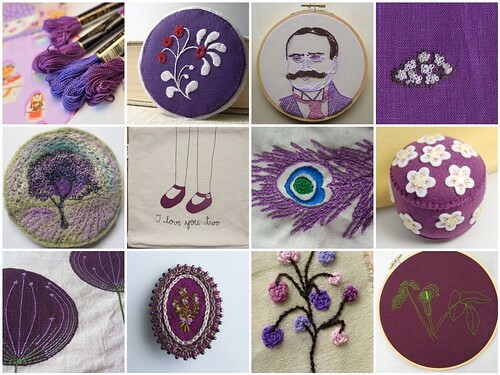 I'm a newbie embroider and haven't done much embroidery in purple hues, but it is such a deep, juicy color. Many thanks for including my purple tree. Purple is a colour I use frequently...one of my earliest memories, is pale purple walls and a patterned purple blanket I had in my bedroom, as a very small child. Purple has always been my fave! Purple is my native land haha! thank you for putting one of my pictures into your inspiration post! i think it's funny to hear that people hated purple before and now love it. i was totally a pink girl, but now i have no pink clothes and lots of purple!